Combine oil, lime juice, soy, paprika, cumin, oregano, garlic and 1 tablespoon of the salt in a bowl and mix until thoroughly moistened. Rub half the mixture under the skin of the chicken getting under the breasts, thighs, and legs. Then rub 1 tablespoon of oil all over the skin on the outside. Arrange onions and potatoes in the bottom of a a roasting pan or large baking dish. Place chicken on top, and roast until the thigh meat is no longer pink and an instant read thermometer inserted into the thigh registers 165°F, about 50 minutes. Let sit at least 10 minutes before carving. 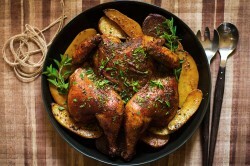 Garnish chicken with oregano, and serve with onions, potatoes, and a spoonful of the pan juices.